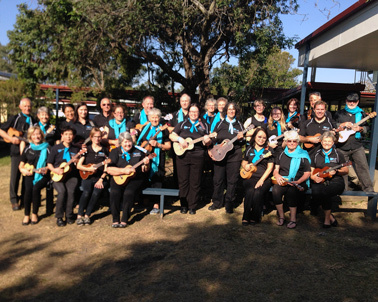 The CAGE are a group of enthusiastic uke players based on the south side of Brisbane. The group formed early in 2015 with a view to performing at SPRUKE. Many of the players were new to ukulele playing, and eager to extend their skills and blend their sounds. The CAGE perform songs ranging from traditional folk songs to classic 60s and 70s and all the way to current hits. What does ‘CAGE’ mean? A clue is to investigate the letter names of the strings and you are well on your way. However we are also known to be the Croonin’ And Groovin’ Ensemble.